Marble Ganesha with Beautifully Painted Peacock ChowkiDimension: Ganesha- H-2.5 Inches, Chowki-..
Celestial marble Ganesha idol,mounted on the marble chowki beautified with subtle strokes of red and golden auspicious colors,jeweled with Kundan work. The chowki / seat is adorned with meticulously designed traditional peacock figure. 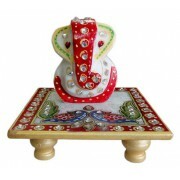 This Chowki Ganesh will add beauty and value to your Pooja room and can be kept at home or office also.